“Harshman Quadrangle.” Digital Gallery. 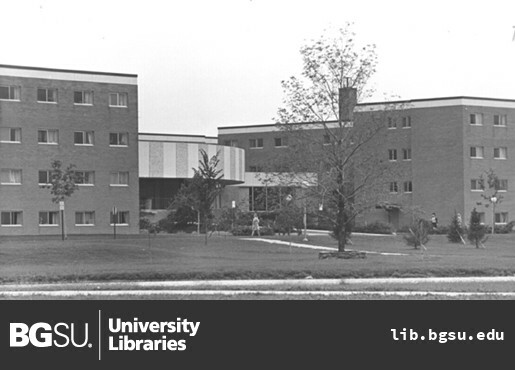 BGSU University Libraries, 4 Aug. 2015, digitalgallery.bgsu.edu/collections/item/8960. Accessed 24 Apr. 2019. Throughout the 1960s, the size of the student population, academic facilities, and physical features of Bowling Green State University were all expanding greatly. The Board of Trustees approved plans for the construction of a quadrangle dormitory that would form part of a series of buildings within close proximity of each other that would provide a "campus-within-a campus" atmosphere. 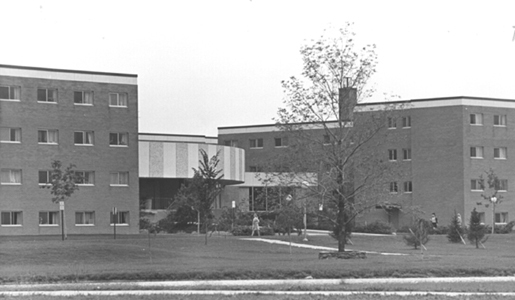 In 1967, Harshman residents participate in a contest to name the four halls, each one starting with one of the letters A through D. The halls were thus named for Ohio author Sherwood Anderson, Ohio novelist and conservationist Louis Bromfield, Apple Orchard planter and pioneer John Chapman (AKA: Johnny Appleseed), and Dayton, Ohio native Paul Laurence Dunbar, the first African-American poet to gain national prominence. Today, due to the aging of the structure and the construction of new housing facilities, only the Bromfield and Anderson Halls remain. 1964, construction completed at a final cost of $6 million. 1964, officially dedicated as Ralph Garling Harshman Quadrangle after the president of the University, 1961-1963 and prior to that Dean of the College of Business Administration. 1965, unit A dormitory becomes an "international wing" housing various international students, unit B dormitory becomes a bilingual hall on two of the four floors. 1968, "kitchenettes" open in the two male halls making up the quad. 1975, "Free University" program established in Anderson Hall, in which, staff and students taught courses outside the classroom. 1995, renovation completed as part of a $15 million Kreischer/Harshman renovation project. Improvements included re-painting, making the front-desk handicap accessible, installation of a new fire alarm system, and renovation of the bathrooms.